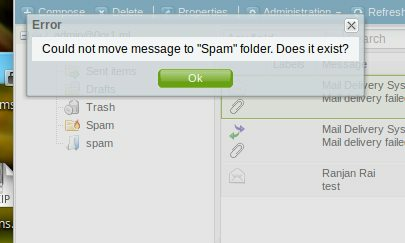 We, like many others I think, connect multiple different (external) mail server to a Group Office. So there are Plesk and ISPConfig Server. We have many users, which "complain" about the not working "Mark mail as Spam" Button. So I decided to make the configuration spam_folder optionally to an array. I used the Learn subfolder, because I train the Bayes filter based on this. This works and solve my problem. Maybe other users also want to use this or it could merged into Group Office, because the "Built In Multiple Account Feature" is the really USP of Group Office and differ from other solutions. PS: Do GroupOffice 6 is available on Github? Then I could prepare a Merge Request, because the modification is backwards compatible.